‘Amazon Books’, the first of two New York City stores from Amazon opened its doors for the first time a week or so ago (Thursday, May 25, 2017), in Columbus Circle’s Time Warner Center on Manhattan’s west side. Amazon’s ‘Recommended For You’ is mimicked in the section ‘If You Like, You’ll Love’; a popular book is laid out next to three others, which Amazon employees have decided on based on similar themes and sales. 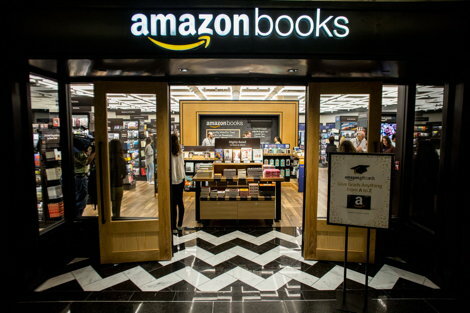 The Columbus Circle store is open Monday-Saturday, 10 a.m.-9 p.m. and Sunday, 11 a.m.-9 p.m. Amazon Books will open another store in NYC, on 34th Street across from the Empire State Building, sometime this summer. This entry was posted on Sunday, June 4th, 2017 at 15:51 @702 and is filed under Scuttlebut. You can follow any responses to this entry through the RSS 2.0 feed. You can leave a response, or trackback from your own site.